Welcome to West Virginia National History Day! Thank you for your participation in WV NHD 2019! We are glad to announce that this year's competition will be hosted again on West Virginia University's downtown campus in Morgantown. It is partnered with the WVU History Department, WVU Libraries, West Virginia and Regional History Center, and WVU Department of Curriculum & Instruction/Literacy Studies. This portal will be the hub for students, teachers, and judges to register in our 2019 contest, but also a source for information and materials. Please click the corresponding tab to your role for more specific information and instructions. Also, if you would like to receive updates and additional information, contact us to be added to our listserv! The deadline to register for the 2019 WV NHD competition has been extended to March 22, 2019. The competition date is April 6, 2019! NHD, a non-profit education organization based in College Park, Maryland, offers year-long academic programs that engage over half a million middle- and high-school students around the world annually in conducting and presenting original research on historical topics. Since 1974, NHD has continuously improved history education by providing professional development opportunities and curriculum materials for educators. It provides the organizational structure for students to enter contests at the local and affiliate levels, with top students advancing to the national competition at the University of Maryland at College Park. This competition serves as a vehicle that facilitates a positive learning experience for students and fosters an environment that promotes the study of history in middle and high school students. It teaches skills of research, creativity, writing, editing, and critical thinking. Participating in NHD is a rewarding experience for strong students interested in history and a great foundation for a future in the field. There are specific rules and guidelines that apply to each category and they can be found here on the official NHD website. All categories, except the Paper, can be an individual or a group entry. This means that exhibits, documentaries, performances, and websites can all be group projects, so grab some friends and get to work! Students, on the student main page tab there are more details regarding process papers and annotated bibliographies that your entries must include. Once a student has completed their project, they will compete in a school level contest against entries only from their school. Once those winners are determined, those students will progress to the state/affiliate level contest held in Morgantown on April 6th. This state-level competition has two divisions; the junior division is middle school students (grades 6-8) and the senior division is high school students (grades 9-12). The most important rewards are the skills and new knowledge that you will acquire as you move through the NHD program. At each level of competition, outstanding achievement also may be recognized through certificates, medals, trophies, scholarships, or monetary awards. A number of special prizes may be given at the regional, affiliate, or national level. In 2018, special prizes for best entires in WV History and the exhibition to be on display at the National Museum of American History were generously funded by the WV Division of Archives and History. 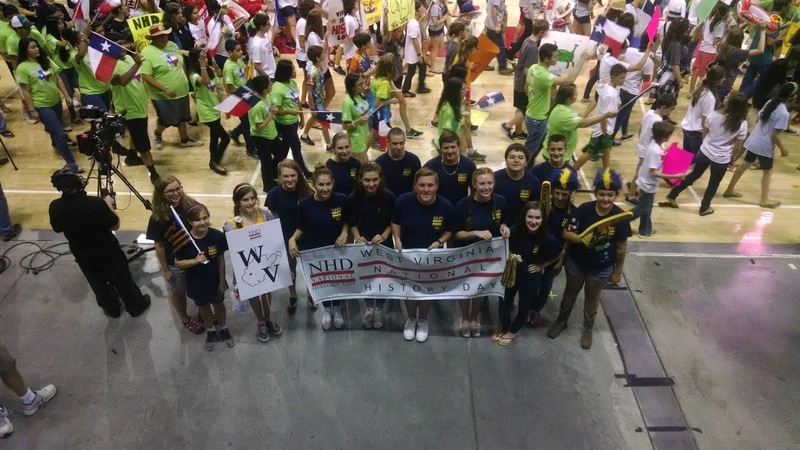 Q: What is the difference between NHD and Social Studies Fair? A: The main differences are that NHD is discipline-specific and emphasizes historical research, students can choose from five categories (documentary, exhibition, performance, website, or paper), and winning state entries have the opportunity to compete in the national competition in College Park, MD, June 9-13, 2019. Q: Can I participate in both NHD and the WV Social Studies Fair? A: No. It is free to participate. Q: How do students qualify to compete in the WV state NHD competition? A: Individual schools will select entries that are to advance to the state competition by either holding their own competition or other means of selection. We have set a limit of 3 entries in each category for groups and individuals per school. There are 5 categories (paper, exhibit, performance, documentary, website) and for all of them except papers, groups and individuals can enter. If you had 3 entries for each category for group (except papers) and individuals, that is feasibly 27 entries per school. Q: Can I choose a West Virginia topic? A: Absolutely. You will have greater access to primary sources if you choose a WV topic. Q: Can I revise my entry after my school and state competitions? A: Absolutely. This is one of the most important aspects of NHD. Students incorporate feedback from the judges to strengthen their entries before advancing to the next competition. Students cannot change categories after the state competition. Q: What are the different research project categories for National History Day? A: There are five different categories, each with their own unique requirements and challenges. They are: a documentary, an exhibit, a paper, a performance, and a website. Q: How many sources should my project use? A: The average national winner uses about 25-30 primary sources and about 25-30 secondary sources…for about 50-60 sources total. Q: What if I can’t find any primary sources on my topic? A: There are primary sources for every topic. It might be useful to think about the place your topic took place and start by searching the state archives and state historical societies. All states have a state archives. You can also review the citations for your secondary sources. You cannot list these in your bibliography unless you actually consult the original sources. Because most secondary sources only include excerpts from an original source, you need to examine the original source in its entirety if you are going to use it to inform your research. If you are still having trouble, feel free to contact Lori.Hostuttler@mail.wvu.edu with research questions. Q: How can I write a good thesis statement? A: Every research project needs a thesis - an idea that you are arguing. A good thesis should be short and to the point and it should sum up your main idea in just a sentence or two. Furthermore, a good thesis should tell what the project is going to prove, while addressing exploration, encounter, and exchange. Q: What is Chronicling America and do I have to use it? A: Chronicling America: Historic American Newspapers is a free database that enables users to read historic local and regional American newspapers from the 1830s to 1922 created through a partnership of the National Endowment for the Humanities (NEH) and Library of Congress. You don’t have to use it, but all entries need primary sources, including available newspaper articles and this is a great source for enhancing your research. At the national competition, a $1,000 prize will be offered in both junior and senior divisions to entries that make the best use of newspaper resources available on Chronicling America. To be eligible, projects must properly cite content from Chronic America and note it in the primary sources section of their annotated bibliographies. Q: What is the judging like? A: All students will meet with a team of 3 judges during the state competition. Unlike the WV Social Studies Fair, NHD entries must stand on their own. The student interviews do not count toward the final scoring. It is a chance for students to discuss their research in a collegial manner with professional historians. There is no need for students to prepare a presentation but simply converse with the judges. They might ask you to justify why you listed a sources as “primary,” how you came up with your topic, or what you learned through the research process. Q: If I win the state competition, how do I register for the national competition? A: We will submit information about the state winners to the national office to open the WV registration within a week after the state competition. There is a $150 per student fee to enter the national competition. We are thrilled that you are participating in WV NHD's 2018 competition! NHD is an excellent opportunity for you to develop your research skills, meet other driven students, and entertain your passion for history. This page will be a quick reference of important information relevant to students with links to find more details. State Contest Date: April 6, 2019. From the list, select "Student"
The "Contest" tab contains information about the contest's schedule, rules, contact info, explanations of what to expect, list of entry categories, and an outline of judging criteria. As a historian, you must use a variety of different sources. Different sources might include: books, letters, pictures, magazines, articles, videos, music, journals/diaries, recordings…the list goes on and on. Visit an archive to do research. While many sources will be available locally and online, unique sources can be found in archives which makes historical research exciting. When you conduct research in an archive, you are viewing one-of-a-kind sources, that cannot be checked out. Most archives will require you to use pencils and sign in upon arrival. Many archives will have a portion of their collections scanned and available on-line. Chronicling America: Historic American Newspapers is a free database that enables users to read historic local and regional American newspapers from the 1830s to 1922 created through a partnership of the National Endowment for the Humanities (NEH) and Library of Congress. Learn more about Chronicling America: Historic American Newspapers. When creating your project, always include historic context...what else important was happening in the world while your project topic occurred? Keep in mind that historical context cannot simply be conveyed in a timeline. In general, secondary sources will help to better understand historical context. For more information on how to cite sources, create a bibliography, and understand the difference between a primary and secondary source, visit the NHD website. Check out this link for a detailed explanation of the theme and potential topics in U.S. History, European History, and World History: 2019ThemeNarrative.pdf. Although your entry may pertain to the history of any place, we encourage students to choose local topics in order to promote usage of local resources. Our state is rich in history and we have many great stories to tell! These stories are held within the primary sources that many local archives and collections possess. Check back for a link to a list of potential local topics. If you see something that is similar to what you are currently researching or something that would be relevant, then check out the links and utilize the sources! NHD has created a new resource on their official website that answers common questions regarding Weebly! This is the program that is used to create website entries, so check it out if you have any problems or questions! Each kit has five engaging primary sources and one secondary source, so they are great for jump starting a National History Day project. The site also has eight interactive lessons on primary document analysis, research skills, designing a project, and plagiarism. Check them out! All projects (except for the research paper category) must include a process paper with the entry. It must describe in 500 or fewer words how you conducted your research and created your entry. how your project relates to the NHD theme. All projects are required to include an annotated bibliography. This bibliography lets your reader or viewers know what sources you used in the creation of your project. An annotated bibliography shows how many sources you used and the quality and range of sources used in your research. It provides evidence of the many hours that you spent doing research in libraries, archives, classrooms, and on the internet. Finally, the annotation lets the reader know how you used your sources and why they were valuable to understand your topic. We are thrilled that you are interested in having your students participate in WV National History Day! NHD is a wonderful opportunity for your students strong in the humanities to develop an entry and compete with similar students across the state. From the list, select "Teacher"
These official NHD guides can help you structure and monitor student learning and research projects in the classroom. You can customize them to fit any class! The national parks are America's biggest classrooms and with these resources you can bring them to yours! Your students can experience all the educational opportunities online and there are lesson plans as well. If their projects involve a NPS site or there is one related to the topic of their project, there are many resources to investigate. Judges are invaluable components of National History Day, and we are glad that you are interested in being a part of this educational and memorable event for our state's students! Judges provide the contest's evaluation, but also the crucial professional feedback that helps students improve their entries and overall history skills. As a judge, you will be assigned a specific category as well as a division (age group) and will evaluate only the entries within that grouping. You will be able to select your preferences of categories that you would like to judge during the online registration process and will be placed within one of your top three choices. Judging teams will be grouped by these placements, then further constructed based on expertise and area of focus to provide a comprehensive and well-rounded team composition. NHD relies on consensus judging. That means that instead of giving entries numeric scores, you will be ranking them. If you are confirmed as a judge, you will be assigned to a team of 3 judges, one of whom will be designated as the captain. It is important that everyone on your team agrees on the overall rankings of the entries you judge. From the list, select "Judge"
Below are the judging instructions for each category, which confirmed judges will receive with their assignments. Confirmed judges will also receive an evaluation form similar to this sample: Sample Evaluation Forms NHD.pdf.